After cementing our place atop the retail POP display manufacturing industry over the last two decades, one might imagine that we’d give in a bit, potentially relax, and even rest on our laurels. Instead we continue to defy competitors and lead the industry with factory-direct, 100% custom retail display racks of all types. 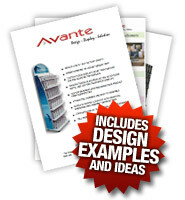 Avante designs a wide variety of interactive kiosks, freestanding, floor, counter and wall mount retail display racks. These display racks will present your product front and center to the prospective customer. Industry leading POP display racks in a variety of dimensions continue to pour out from our manufacturing site – displays that grow the reach and performance of sales forces for a long list of product and service providers. In House Design: In house design means all ideas are translated seamlessly from concept to creation. Our designers are able to bring to life any idea for display racks, and nearly every effort from them provides clients with design that exceeds expectations. True artistry is difficult to come by, and we’ve put together a team of designers that seemingly has no creative limitations. In House Print: Rendering a design concept is one thing. Translating the concept without compromise through the printing process is another. Many of you in the sales and management world will be familiar with the challenges of even menial print work. When it comes to high end production level print work intended for complicated production, print can become terribly complicated. Our print team works side by side with our designers to make sure the translation of image to display is flawless. In House Production: The final step in the manufacturing process of display racks is production; and it is here that our clients’ true expectations are met. Creating an image of a display on screen is one thing. Creating the final physical product is another. Avante’s production team is in house, and works with printers and designers to ensure the flawless translation of concept to a real life sales performer. Eco-Friendly Materials: We do have a stake, however small, in what the future will be. We’ve done our best to incorporate eco friendly materials to show that design and production can be achieved with keeping the overall environment in mind. Industry Leading Performance: And most important to our clients — we’re able to continually produce attractive display units that simply outproduce our competitors. Success stories continue to pour in regularly, and stories such as Mr. Birch’s are what drive us to continually push the industry forward with more creative, better producing displays. Learn more about the retail display rack manufacturer that knows no compromise.